If you haven’t gotten on board with the sneaker trend, I’m hoping you will after reading today’s post. Sneakers aren’t just for workout outfits and going on a run. They’re actually more encouraged than ever and have also become quite trendy! For all my regulars, you know how much I love a good sneaker. I love them so much in fact that they are taking over my shoe closet and I now have more sneakers than I do heels. What can I say? Comfort trumps all (IMO). It’s also great when you find a shoe or sneaker you love so much that you buy it in multiple colors. I have a few favorite sneaker brands/styles that I own in various color combinations and the Reebok Aztrek has quickly made its way to the top of my list. 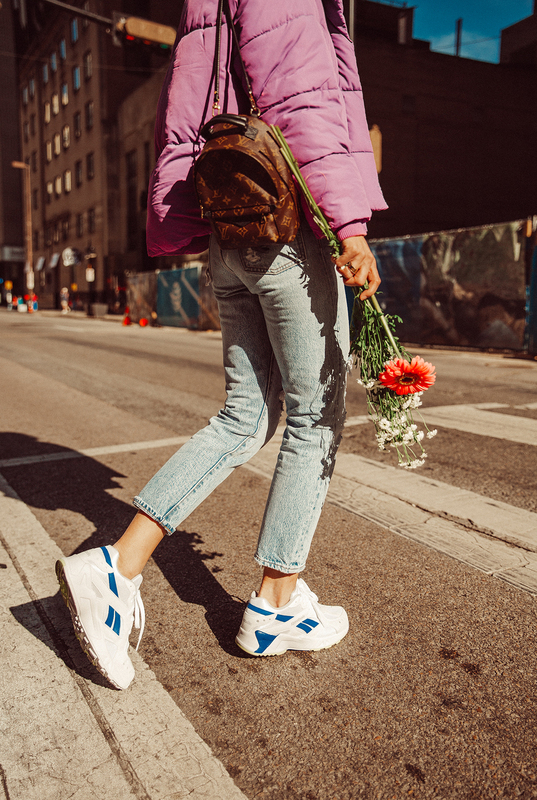 Power suits and sneakers were one of my favorite fashion week trends, so I styled another fun version of the Reebok Aztrek sneaker in this recent post. Today I’m sharing more of a casual look, because the Aztrek sneaker can be worn with literally anything. We had a bit of a cold front in Dallas this past week, so I threw these on with some distressed jeans and this cozy puffer jacket. Next on my list? A fun swing dress. Wouldn’t these be so cute with this dress for Spring? They are truly SO comfortable. And I love all the fun color combinations this style comes in. I will be wearing these on repeat this season and most likely to an upcoming festival 🙂 If you aren’t on board, you need to get on board. Trust me, your feet will thank you later!